Some businesses go to pay sales tax but then realize they don’t have the necessary funds. This is the last situation you want to find yourself in, but it’s a reality. It’s especially common for small- to medium-sized businesses that aren’t required to pay sales tax on a monthly basis. These businesses collect sales tax, see money sitting in their bank account, but forget about coming due dates for sales tax payments. They continue operating as if their working capital is higher than it really is. Then when that sales tax due date comes, they are in for a nasty surprise. To avoid this pickle, we highly recommend transferring your collected sales tax funds to a separate bank account. This should be done on at least a monthly basis. Then you will have a true knowledge of your business’ working capital. Knowing your working capital will not only help you avoid the pickle already mentioned but also help you make more informed operational and strategic decisions. You can also sleep better at night, knowing that the necessary funds are set aside. Letting things fall through the cracks is one of the most common problems with ecommerce sales tax compliance. There are two reasons for this: (1) ecommerce sales tax compliance has a lot of steps, and (2) sales tax compliance is not your most pressing day-to-day issue for ecommerce businesses. Wow, ‘nuff said. If you haven’t already, you should be signing up with one of these companies. Ecommerce sales tax is complicated. Many small- to medium-sized businesses ignore it for too long. Some businesses will be penalized for past due taxes and will be required to retroactively pay. This can be devastating for a business. So, what do you do if you haven’t been paying taxes? How do you know if you have been accurately paying in every state? 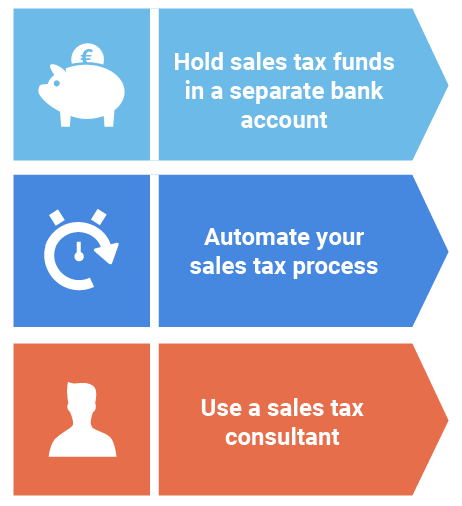 Is your sales tax process covering all your bases? To answer these questions, you need the help of a sales tax expert. Hiring a sales tax consultant will be worth your time and money. If you need a starting point, we have a list of consultants who have great track records. Don’t hesitate to reach out. Then you can focus on growing your business without the worries of something as simple as sales tax getting in the way. Best of luck in your journey to ecommerce sales tax compliance and, more importantly, your journey to having a thriving business.